IRVINE, Calif., Oct. 31, 2017 /PRNewswire/ - The management at Zymo Research Corp. announced today a joint agreement with VWR to sell and distribute Zymo Research's DNA purification, RNA extraction, microbiomic analysis, and epigenetics products throughout North America. VWR (NASDAQ:VWR), headquartered in Radnor, PA is the leading, global, independent provider of products, services, and solutions to laboratory and production facilities for customers in the pharmaceutical, biotechnology, industrial, education, government, and healthcare industries. 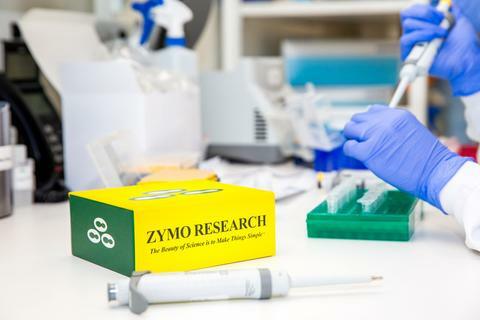 This supplier agreement allows Zymo Research's current portfolio of nucleic acid products to be sold through an expanded distribution channel to pharmaceutical, diagnostic and manufacturing customers including the environmental testing, water treatment, food quality and bioremediation markets. Marc Van Eden, Vice President of Business Development at Zymo Research Corp. commented, "Zymo Research's product lines complement VWR's current offerings. Our partnership with VWR will open many more distribution channels for Zymo Research's products to other scientific markets that we currently are not able to serve. Partnering with VWR is a win-win situation in that not only does Zymo Research reach a larger customer base but we also bring value to VWR's portfolio of nucleic acid products." The supplier partnership is a strong strategic fit that leverages the strengths of both entities. Zymo Research is well known for its simple and innovative technology that makes the entire DNA/RNA extraction process easier for researchers. VWR's 160-year history of expertise and large customer base, along with its mission to enable science is a great asset to this collaboration. The partnership will create a comprehensive nucleic acid solution for Zymo Research and VWR's customers.